I live in a small town. I drive by the funeral home almost every day. I cannot count how many times over the last 3 years that I have watched someone walk out of the funeral home with their “purple folder”. Every time I see it I pray for that person. My heart hurts for them, because I know what is in that folder. A receipt for a coffin. A receipt for cemetery plot. A receipt for a tombstone. A rough draft for a funeral service….and the obituary that will be printed the following day. 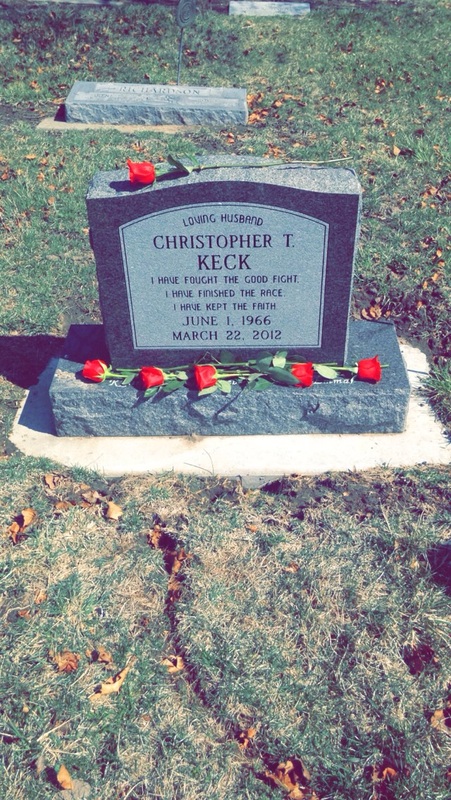 Today marks 3 years since Chris died. These last three years literally seem like the whole of my life. Memories before that seem far, far in the past….so thankful for new memories being made. How I wish that I could comfort each person that leaves that funeral home with these words. That’s always my prayer..that they already know them, or will hear them. As I contemplate this new year ahead of me, what comes to mind is “new beginnings”. I no longer wake up with the pit in my stomach as reality rushes in. I have learned that I have a faithful God. I’ve learned it’s okay to ask for help. I’ve learned that grief does not kill you. I’ve seen the selflessness and love that my friends and family have for me. I’m learning daily how to be a single parent, I’ve learned that it’s okay to cry..whenever, wherever. I’ve learned that I can actually problem solve quite a few things on my own (except for installing ceiling fans :-)) I’ve learned that there’s a whole lot I do not know. I’ve learned that I’m no longer in survival mode but living purposefully each day. I’ve learned that I still have a future and I’m looking forward to it! So while death is final it is also a part of life. Fearing it, for the believer, is not living in Hope, and to put it bluntly, is just not living in reality. Accepting death helps you perceive life properly. Accepting death helps you put in perspective small misfortunes and self importance. Accepting death helps you respect life. Ironically, accepting death makes you more alive. Jesus came and died the ultimate death, so that He could promise eternal LIFE. ← God has planned the circumstances that has molded our lives to this point…..
Wow, thank you, Nicole. This is just excellent! Experience-tested gems of truth we all need to hear. Thank you, and special condolences as it still all seems so fresh, standing around the tent, hearing Taps, watching our Flag folded, feeling the crush of Death which will someday be thrown into the lake of fire (Rev. 20:14). It is so joyous to see you feel the freshness of your new beginning in this new season of life! Love you Miss Pam..cannot wait to see you! I was just thinking of you and Chris. I can’t imagine what these years have been like. I always think of you bringing so much joy and fun to those around you. I wish and pray for joy upon joy to fill your days to come until you are reunited.